For more than 100 years in the U.S., there has been a commitment to environmental sustainability by supporting and participating in conservation programs and practices that protect natural resources in the United States. Supported by more than a century of environmental sustainability regulation, the United States continues to share the world’s values through innovation, improvement and a legacy of commitment to global sustainability. For example, in the early 1900s President Theodore Roosevelt created the U.S. Forest Service, which established 51 federal bird reservations, four national game reserves, 150 national forests, and five national parks. And the National Park Service was created, covering 401 national parks and protecting 400 endangered species. In the 1930s, a major conservation program was established — the Soil Conservation Service. In the 1940s, the Federal Water Pollution Control Act was created to conserve and protect interstate waters. In the 1950s, the U.S. Congress passed the first federal legislation addressing air pollution — the Air Pollution Control Act. Sustainability initiatives in the 1960s included the National Wilderness Preservation System and the Solid Waste Disposal Act. The U.S. Environmental Protection Agency implemented numerous standards and regulations related to conservation and environmental sustainability in the 1970s. And the first Earth Day was celebrated by 20 million Americans. In the 1980s, farmers began to voluntarily enroll in the Conservation Reserve Program, which provided financial incentives for environmental protection. In the 1990s, the Wetlands Reserve Program restored and protected 405,000 hectares of wetlands and uplands, and the Sustainable Fisheries Act was expanded. Milestones in the 2000s: the U.S. Forest Service has set aside 23.5 million hectares of wilderness to remain undeveloped for future generations, and the EPA has established standards for the use of renewable biofuels. Also, since 2000, USDA’s Agricultural Marketing Service has promulgated standards for organic foods in response to a mandate from Congress. 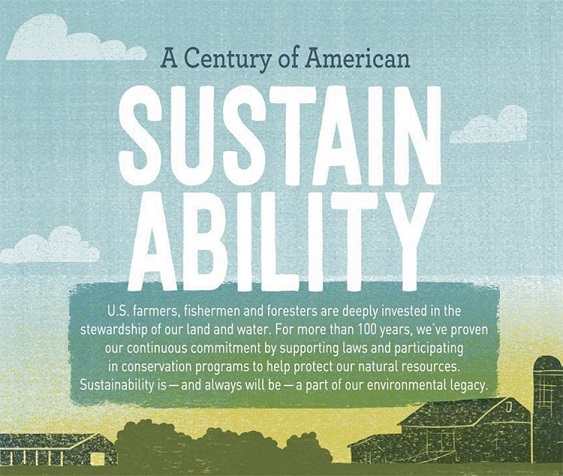 Read 10 facts about U.S. sustainable practices to learn how the U.S. has been practicing conservation and sustainability long before they became the issues they are today. And to learn more about the sustainability practices of various industries please visit our Fact Sheets page.